It is customary in Japanese dojo to find a picture of the founder of the Art or School and other masters held in high regard. 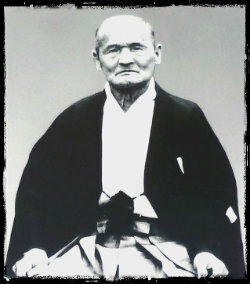 In our dojo we display a picture of Takeda Sōkaku, Morihei Ueshiba as well as the founder of Shodokan Aikido, Kenji Tomiki. Takeda Sokaku was a renowned martial arts master of Daitō-ryū Aiki-jūjutsu (大東流合気柔術) and Ono-ha Itto-ryu swordsmanship. During his lifetime he is credited with teaching many famous martial artists among them the swordsman Shimoe Hidetaro, Aikido founder Ueshiba Morihei, as well as many politicians, military officers, judges, policemen, and other persons of high social standing from all over Japan. An astute if not paranoid businessman, Takeda, kept meticulous records of his student registrations and to those he awarded menjo including the terms under which he expected remuneration. 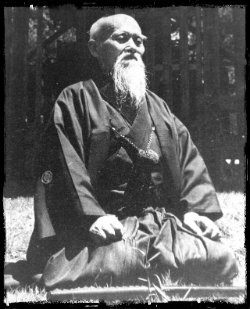 Morihei Ueshiba, was a skilled exponent and teacher of Daitō-ryū Aiki-jūjutsu. He awarded certificates in Daitō-ryū to many of his recognised first generation (pre-war) students which later were equated to 8th Dan in Aikido. 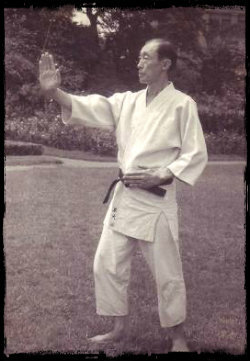 To separate himself from his teacher, Takeda Sokaku, he eventually changed the name of what he was teaching to Aiki-Budo and Aiki-jūjutsu which was later changed to Aikido. As Ueshiba grew older, less physically able and more spiritual in his outlook, his focus on teaching waned. It was during this time that his son, Kisshomaru Ueshiba, and other seniors created the curriculum and teaching methods that is now taught in Aikikai aligned Aikido schools. After his death, and another period of reorganisation, Kisshomaru took on the mantle of Doshu (hereditary head) and oversaw the formation of the Aikikai Honbu organization and the promotion of 'Aikikai' Aikido worldwide.